Mr. Chancellor, Michael Koerner is a universally respected Canadian business leader, one of our nation’s most supportive patrons of the Arts, and a loyal and longtime friend of this university. Among the many well-known organizations to have benefited through his generosity and guidance are the Art Gallery of Ontario, the Toronto Symphony Orchestra, the National Ballet School, the Ontario Arts Council Foundation and the Royal Conservatory of Music. His contributions to the Arts have been widely acknowledged, beginning in 1984 when he was made a Member of the Order of Canada. In 2006 he was awarded the Edmund C. Bovey Award, a national award given for outstanding and longtime support of the Arts. A lifelong pianist and harpsichordist, Mr. Koerner was appropriately honoured in 2011 when he was appointed as the first Chancellor of the Royal Conservatory of Music. 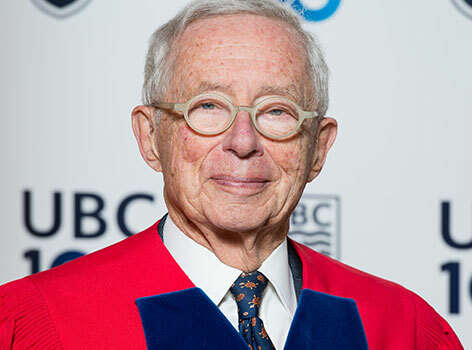 He is particularly well-known within the university community as a member of the Walter C. Koerner family, which has been instrumental in laying the foundation for UBC as we know it today. Following the lead of his father, he has had a strong hand in advising and supporting major UBC projects, most notably the Museum of Anthropology, which he has helped to transform into one of the most advanced anthropological research facilities in the world. Similarly, his contributions to the Faculty of Forestry’s Loon Lake Research and Education Centre were instrumental in revitalizing an important forestry education camp, and his recent gift to The Djavad Mowafaghian Centre for Brain Health is advancing knowledge of brain disorders, including bipolar disorder, schizophrenia and autism. Indeed, rare are individuals such as Michael Koerner, who possess the wisdom, desire and capability to advance such a broad spectrum of initiatives for the benefit of all Canadians. Fortunate are we who have been chosen to work with him in support of shared dreams and aspirations. Mr. Chancellor, in recognition of a lifetime of vision and generosity that have touched the lives of countless Canadians, I ask you to confer the degree Doctor of Laws, honoris causa, upon Michael M. Koerner.